Detectives searching for missing West Yorkshire schoolgirl Shannon Matthews have said they fear she may have fallen into the "wrong hands". Det Supt Andy Brennan, leading the search for the nine-year-old who has been missing for a week, said he was gravely concerned. Mountain rescue teams and specialist dogs, trained to find bodies, have been drafted in to the Dewsbury hunt. Shannon was last seen on her way home from school last Tuesday. "What concerns me greatly is that she may have fallen into the wrong hands," Det Supt Brennan said. The senior detective also appealed for information on anyone seen acting suspiciously in or around Shannon's school, Westmoor Junior, on the day she disappeared. "We are using all available technology and expertise including behavioural experts and a team of dedicated scientists," he said. He added the inquiry was similar in structure to a murder investigation and sniffer dogs, trained to seek out human remains, have been used. "While we hope and pray that Shannon will be found safe and well, we remain gravely concerned," Mr Brennan said. "We are not excluding any possibility as to what has happened to Shannon that afternoon." Police have conducted a "routine" search of a house belonging to an uncle of Shannon. The house, in Moorside Road, Dewsbury Moor, which adjoins Shannon's, belongs to Neil Hyett and his wife Amanda. Further images of Shannon on her birthday last September and the actual coach that returned her and her classmates after their swimming lesson last Tuesday, just before she went missing, have also been released by police. Mr Brennan said: "The coach is maroon and appears very distinctive in colour. I would appeal to anybody who was in the area last Tuesday to think back to that time." Friends and neighbours of Shannon held a vigil on Tuesday evening to mark one week since she disappeared. They walked with colourful balloons from the local community centre in Dewsbury Moor to Shannon's home. A banner strung across the house in Moorside Road urged the nine-year-old to come home. 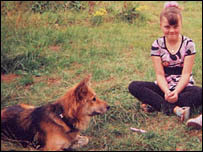 Shannon is described as timid, about 4ft 1in, with shoulder-length hair that may have been tied in a ponytail. She was last seen leaving Dewsbury Sports Centre where CCTV footage showed her wearing distinctive pink Bratz boots. West Yorkshire's chief constable praises the work of his officers.